Description: BNSF 5298 and NS 8987 are on the point of an eastbound ready to head out on the Fallbridge Sub. Description: Another shot of C-GFDCOB on the sweeping curve at Fisher on the Grand Forks Sub. Description: I thought this shot was neat, with original BN paint, SF Warbonnet paint, and the combo of the two with H2 on the point. Description: I'm getting a friendly wave from the cab as these BNSF units elephants a coal drag east on the Grand Forks sub. Description: I was railfanning at the Round House Lead. Description: supposed to be a 0. Description: Looking Like a BNSF Paint scheme heratige line up BNSF 7788 holds the 3 engine light engine movement in of the Round House Lead while an SD70MAC pulls in to get sanded and refueled, after the 70MAC leaves The 3 chug out of the track and onto a grain in the yard. 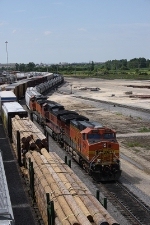 Description: Yet another BNSF train seen from the cab of LLW SD9 4433; 11,800 horses have control of this Z-PTL train. He was creeping along, as he was waiting for the Willamette River draw to get locked up. Description: Westbound on the BNSF Chillicothe Sub. Description: A southbound BNSF manifest makes it way through Houston. Description: M-GFDSUP leaving East Grand behind.